Ugly Pizza uses their own specialised couriers to deliver their food. Bacon, nacho cheese, sour cream, and shallots. Beef, cheddar, onion, pickles, mustard, ketchup, and aioli. Beef, cheddar, lettuce, tomato, pickles, and huxley's burger sauce. Fried chicken, cheddar, creamy slaw, and mustard BBQ. Beef, cheddar, smoked bacon, lettuce, tomato, BBQ relish, mustard mayo. Portobello mushroom, kale, smoked tomato, onion rings, aioli. Pulled pork, smokey bacon, sticky pork rib, spicy BBQ sauce. Grilled chicken, bacon, lettuce, avocado, tomato, smokey mayo. Double fried chicken, bacon, lettuce. jalapeno mayo. Double beef, bacon, cheddar, pickles, Huxley's sauce, spicy BBQ sauce. Roma tomato, buffalo mozzarella, basil, and red sauce. Ham, mushroom, olives, and artichoke. Mushroom, capsicum, onion, pineapple, and olives. Pepperoni, shaved ham, olives, green capsicum, red onion, pineapple, and mushroom. Pepperoni, mushroom, green capsicum, olives, prawns, garlic, chilli flakes, and oregano. Poached chicken, streaky bacon, and green capsicum. Pepperoni, shaved ham, chorizo, and Italian sausage. Pulled pork, bacon, pineapple, jalapeño, and shallots. Beef, pulled lamb, poached chicken, italian sausage, shaved ham, and chorizo. Beef, cheddar, onion, pickles, mustard, and ketchup. Pulled pork, sour cream, pico de gallo, jalapeño, and guacamole. Wild rocket, prosciutto, buffalo mozzarella, and parmesan. Italian sausage, pepperoni, and oregano. Chicken, bacon, green capsicum, shallots, spanish onion, and peri peri mayo. Italian sausage, meatballs, pepperoni, oregano, and parmigiano. Prawns, chorizo, bacon, red onion, feta, rocket, and lemon. Chicken, blue cheese, celery, shallots, spicy buffalo sauce. Slow cooked lamb, Roma tomato, feta, red onion, oregano, and mint yogurt. Grilled eggplant, zucchini, artichoke, fetta, basil pesto. Mozzarella, bocconcini, gorgonzola, and parmesan. Rosemary potato, streaky bacon, caramelized onions, sour cream, and spring onions. Mushroom, red onion, kale, gruyere, and truffle oil. Poached chicken, smoked bacon, mushroom, parmesan, and shallots. Caramelized onion, feta, roast pumpkin, wild rocket, and pine nuts. Beef brisket, red onion, jalapeno, ranch dressing, spicy bbq sauce. Bolognese sauce, tomato, parmesan, oregano. Iceberg, tomato, corn, radish, shallots, quinoa, parsley, and house dressing. Cos lettuce, parmesan, streaky bacon,garlic croutons, egg, and caesar dressing. Half rack pork and half rack beef. 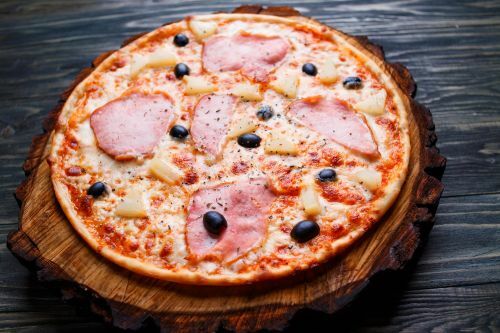 Shaved ham, pineapple, and mozzarella. French fries, mozzarella, and aioli. A range of flavours available.